As physical objects that can be made and sold, globes are obvious candidates for patent protection. Mid-nineteenth-century patents typically focused on the globe’s frame or mounting, cleverly configured to show seasonal differences, mimic the precision of scientific instruments, and appeal to the education market. After 1900 globe makers shifted their attention to less complicated varieties marketed as decorations for homes and offices. 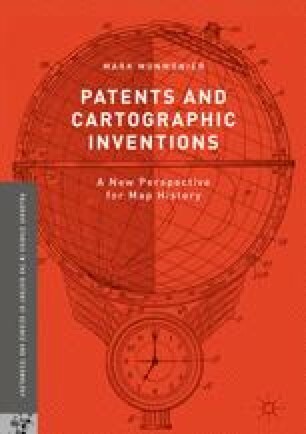 Subcategories recognized by the US Patent Classification reflect advances in enabling technologies such as rubber manufacturing and electrical power, which gave rise to the inflatable globe in 1868, the illuminated globe in 1914, and the motorized, clock-driven globe in 1930. Increased filings after 1931 reflect more efficient production methods, and another group of innovative globes followed the launch of Sputnik I in 1958.